Dan Vyleta’s The Crooked Maid pulls readers into a suspenseful, dark tale as swiftly as the train carrying Anna Beer and Robert Siedal pulls into the Vienna station. Although it does share some characters with the author’s previous novel, The Quiet Twin, it can be read as a standalone novel. Both novels are suffused with tension, darkness, and the sense that the travellers in the next compartment are observing something horrifying that is just out of the reader’s sight. Sometimes this ominous feeling is tangible. Sometimes the reader is shielded from darkness. What is yet undiscovered, what is concealed: the reader of The Crooked Maid is always peering behind a curtain, often discovering something of queer and unexpected contrast. In The Quiet Twin, the question of perspective was vitally important, both to the story and the craft of telling it. In The Crooked Maid, this is equally but differently true. What one sees, what one knows to be true: these characters struggle to define their own vision of the world around them, so dramatically altered in the past decade. As with the elements of atmosphere, the theme of perspective is sometimes presented overtly, as with this striking passage about a hand-crafted glass eye. And, sometimes, the question of perspective and sightlines appears in an altered guise in the story. The reader is in a similar position to this red-scarfed man. He and the reader follow the light that Dan Vyleta casts upon the narrative, following and shifting (arguably, leading) as required. Not only does the narrative proper leave many of the reader’s questions unanswered, but there is a framing narrative to unravel as well. There are also occasional remarks which appear to be offered to readers as hints. “Chekov said that if you introduce a gun in Act One, it has to go off in Act Three. He does not tell us what happens if you introduce it in Act Three. With the framing narrative, these short addresses take on a peculiar significance. The reader senses that there is something to see, to take note of, but perhaps it is behind a curtain. The italicized segments of narrative have a similar effect on the reader. They surround the story proper and are clearly connected to the story as observations on this post-war world, and yet they feel remarkably disparate stylistically. This adds to the sense of things being slightly-off-kilter until, finally, with the novel’s final passages, the gap (that readers may have perceived, but which did not, in fact exist) is breached and secured. 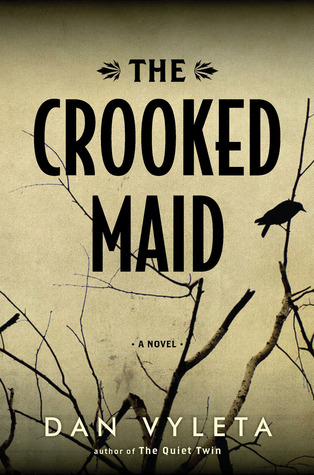 The Crooked Maid is an outstanding story, and behind its curtain is a writer to watch. I was tempted to try The Quite Twin first, but I did end up reading this one first. It was a very dark, twisted story, that had me reading frantically at times – while at other times I lost interest. But the author did write such complex and intriguing characters. It is a book that leaves a lot unanswered, but I enjoyed it. And I think I will be hunting down a copy of The Quite Twin. But not unanswered in the total-mystery sense of things, right? Just some of the ‘why’ is left to readers’ imaginations. I like that: the balance between known and unknown works for me. I would not have been sorry to see this one take home the Giller. Sounds fascinating, and I love the quotes. The book has just been shortlisted for this year’s Giller Prize, too. That pleases me greatly because it really is terrific and I hope it finds many new readers. I am number one on the hold list at the local library and now I am really looking forward to this! Thanks. Are you tempted to try The Quiet Twin first? They both read very quickly. You might not think so, because of the page count, but the stories are gripping.